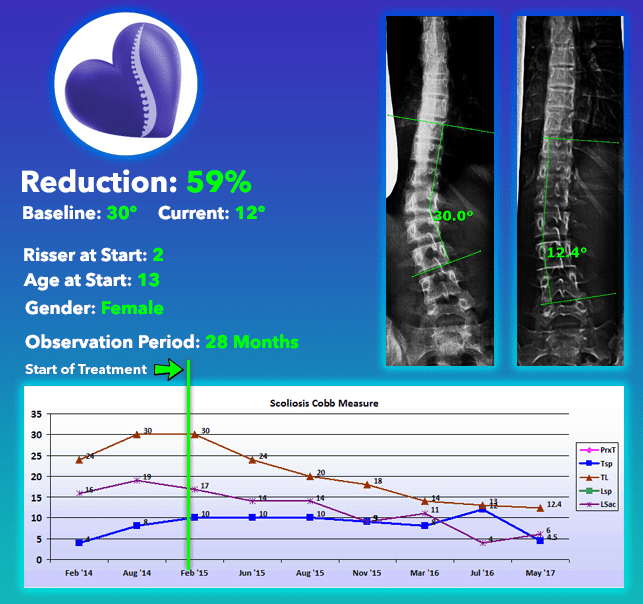 No two people are the same, thus no two spines are the same; this is especially true when concerning scoliosis. 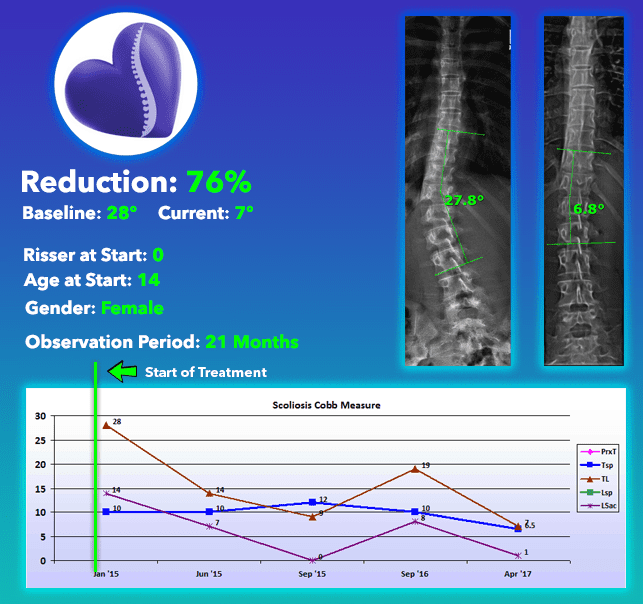 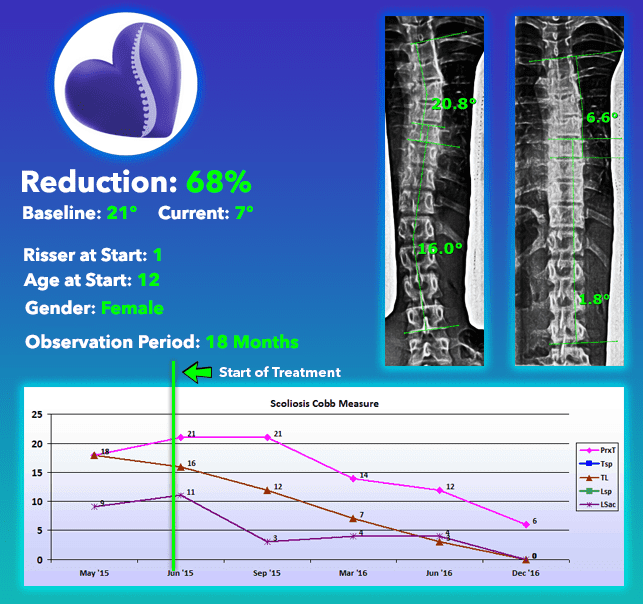 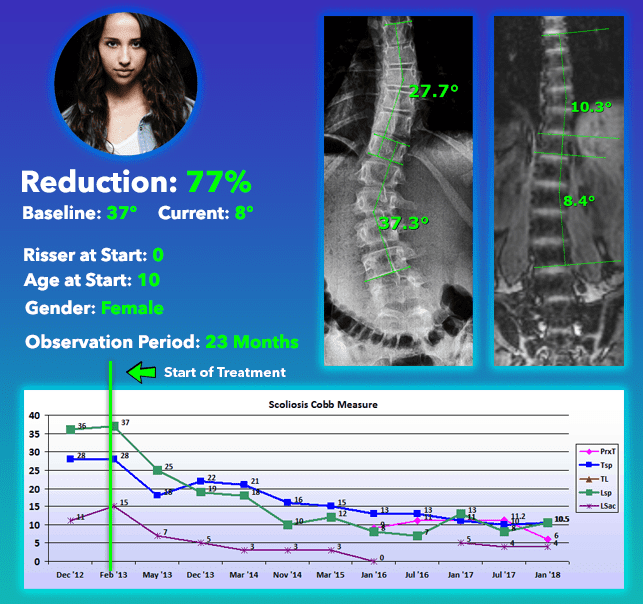 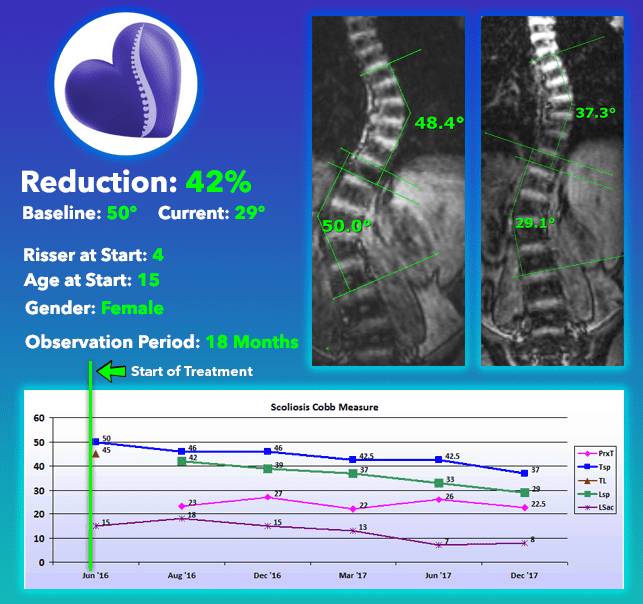 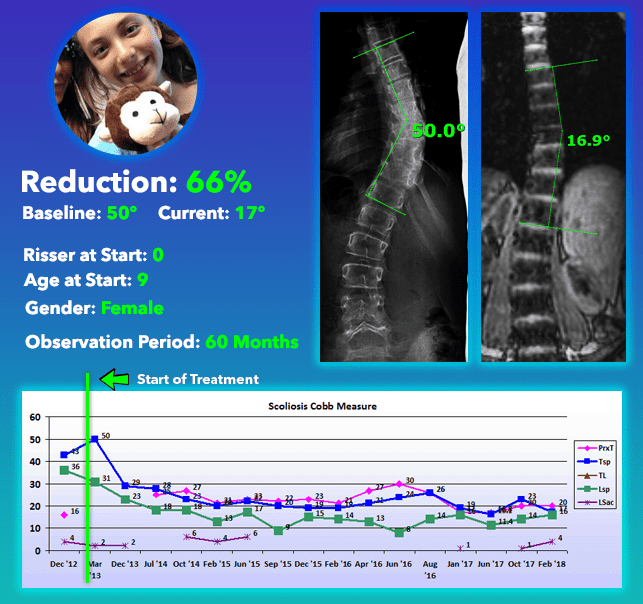 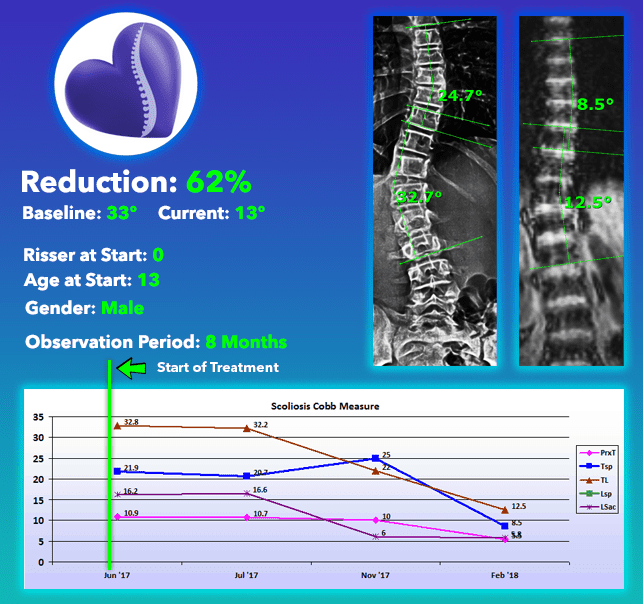 There are many factors that go into determining how successful one will be when treating scoliosis and the scoliosis curve reduction one can expect. 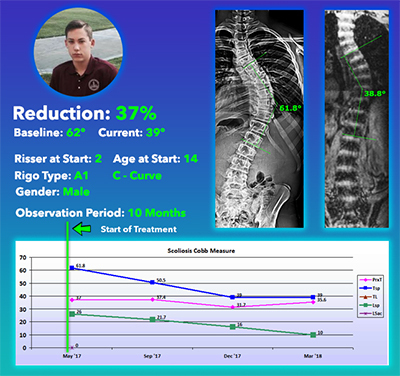 These include; initial Cobb angle, age, gender, Risser (or growth stage), compliance, the shape of the scoliosis (C-curve or S-curve), and more. 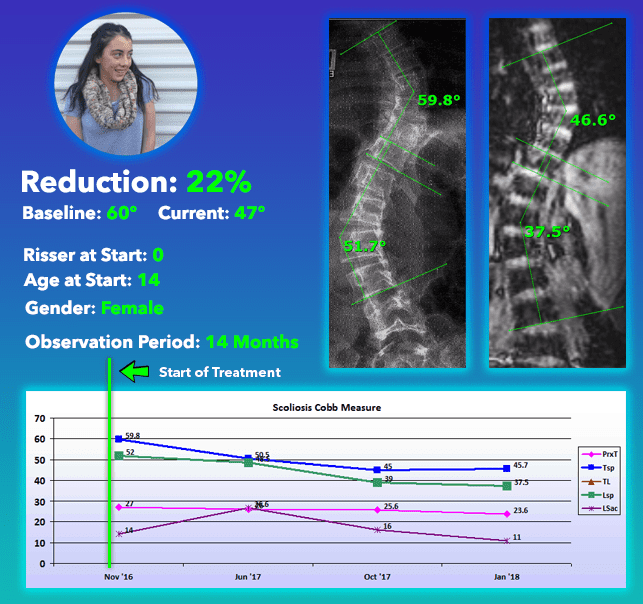 If we thoroughly understand each patient and their curve, we can then develop realistic expectations for their scoliosis treatment. 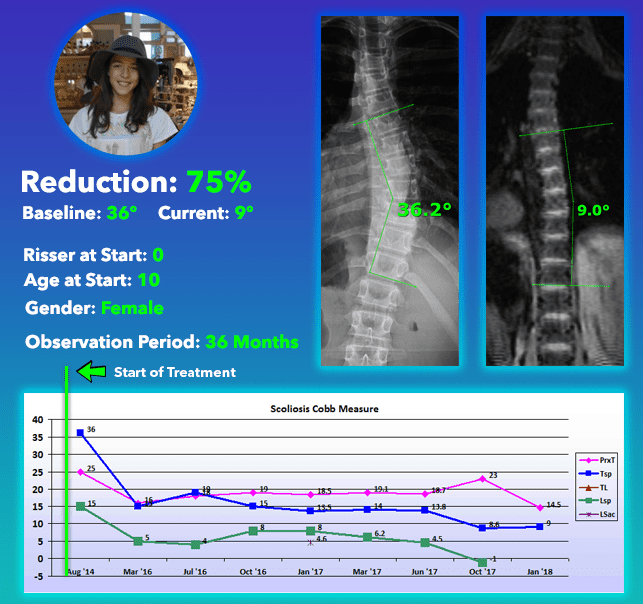 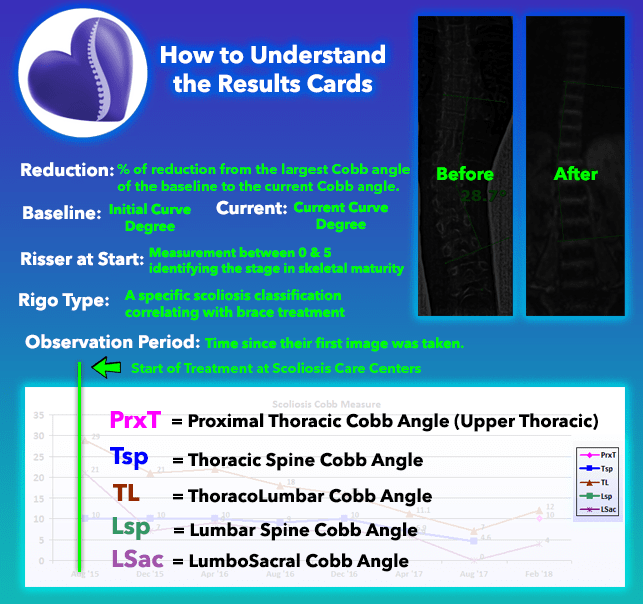 Since there are so many elements that determine the degree of success in treating each case or type of scoliosis, we’ve categorized our past cases below for you to have a better idea of where you fit. 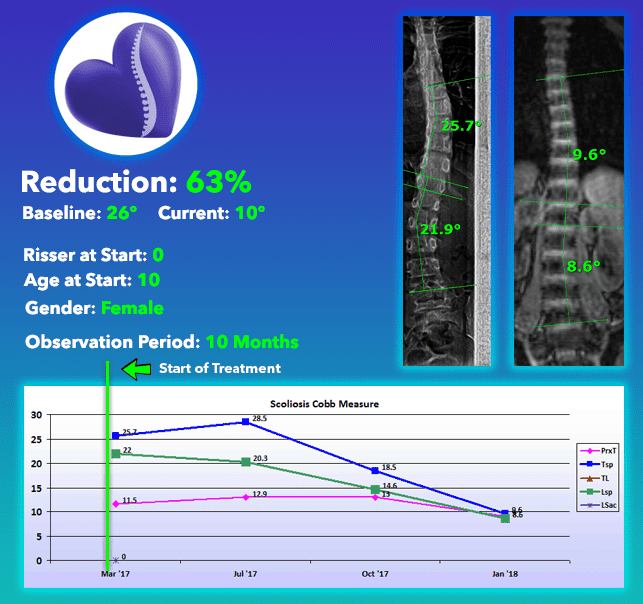 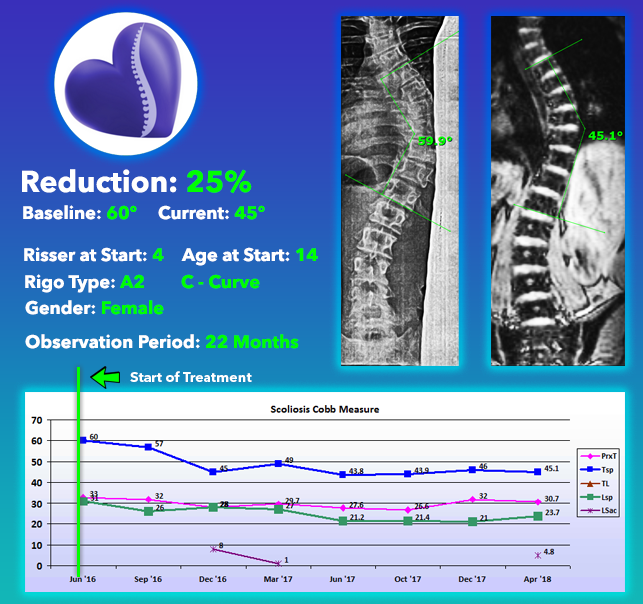 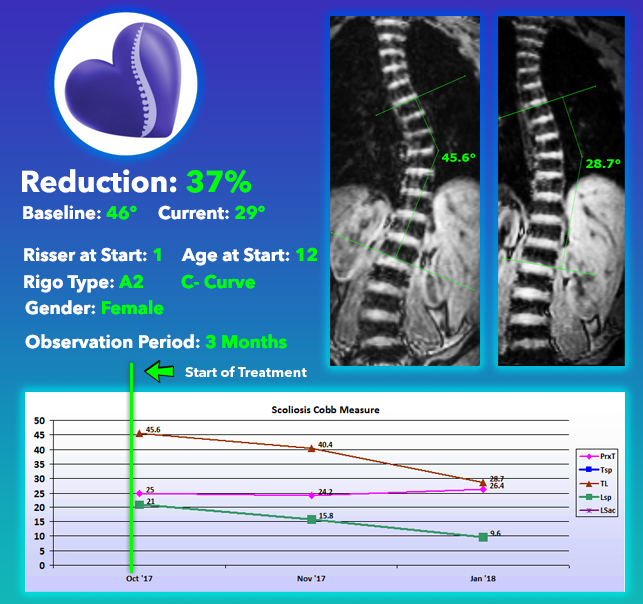 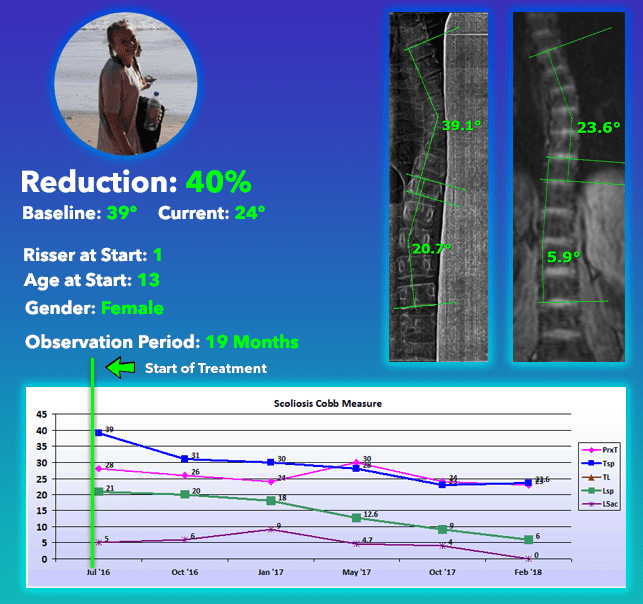 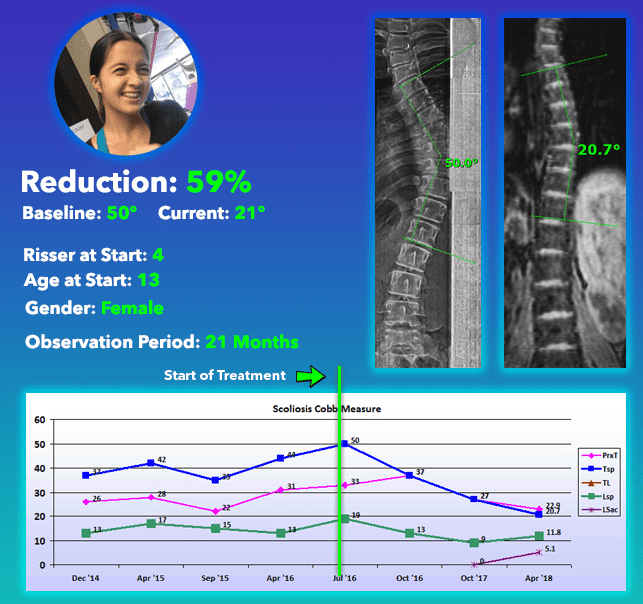 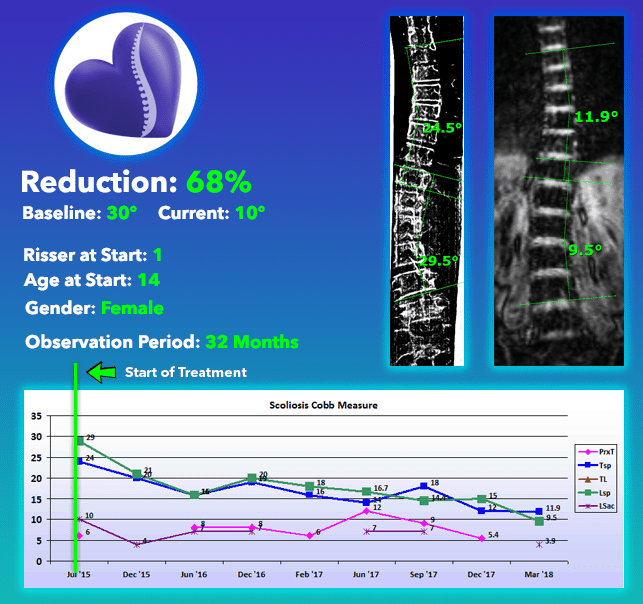 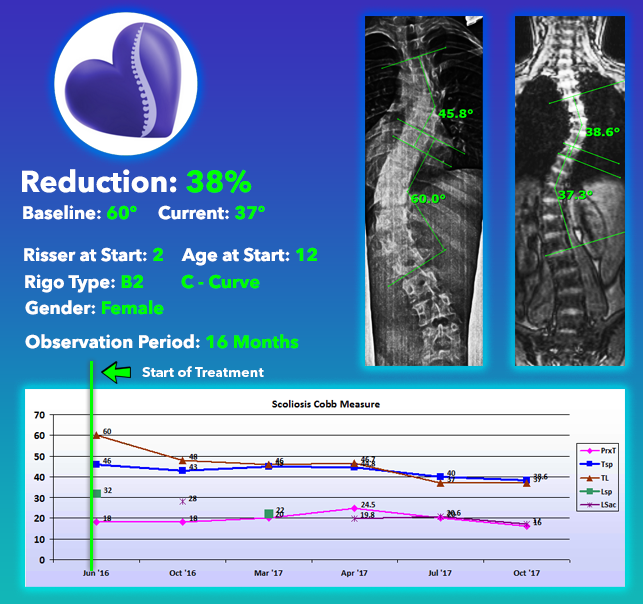 Each image below is one of our patient’s scoliosis treatment results that we’ve been given permission to share. 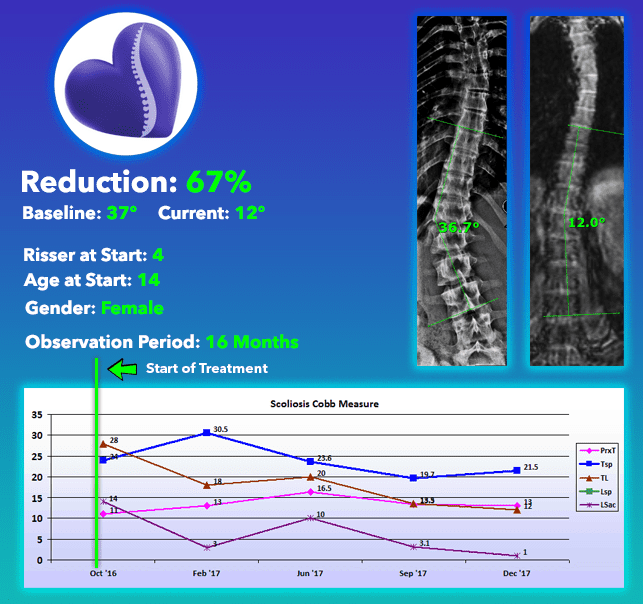 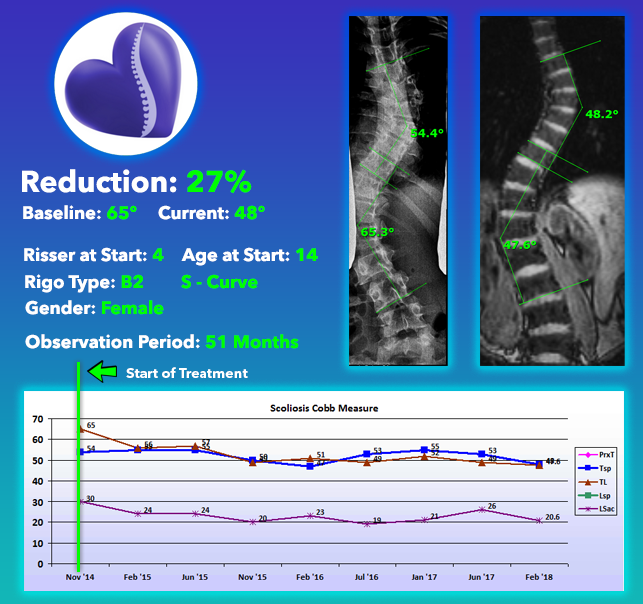 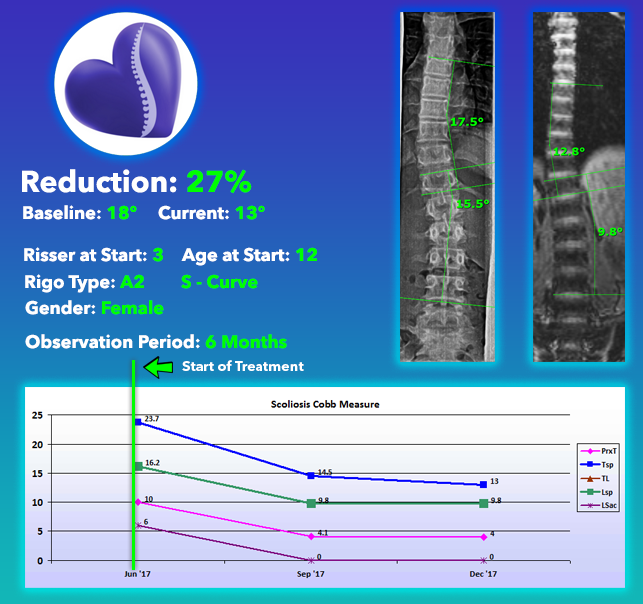 The groups are categorized by the initial curve size at the start of treatment at Scoliosis Care Centers. 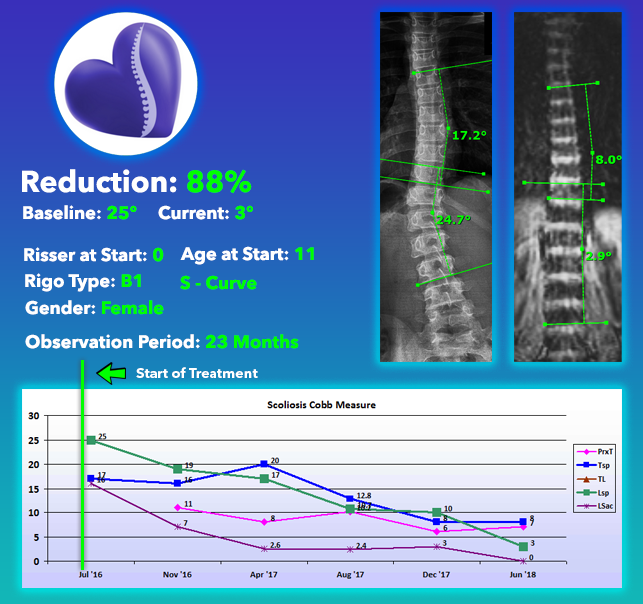 While not every patient’s case is on this page, the statistics represent our entire database of curves within that degree range WITHOUT filtering for compliance. 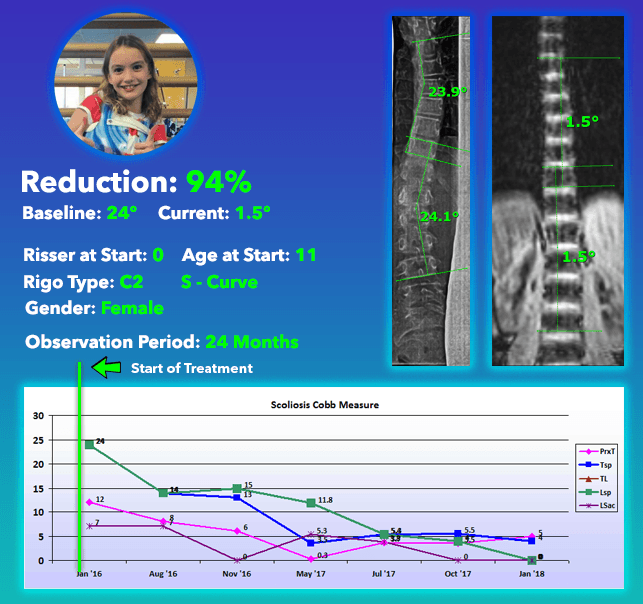 For more information on how we measure success click here. 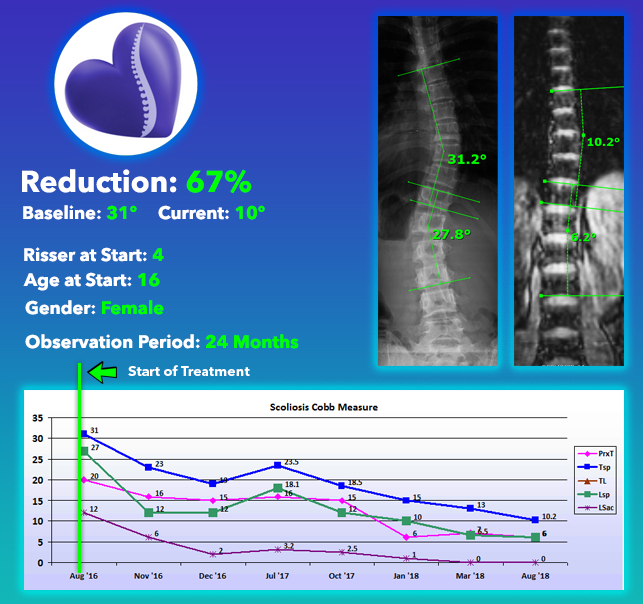 The two Xrays on each tile illustrate the before and after results. 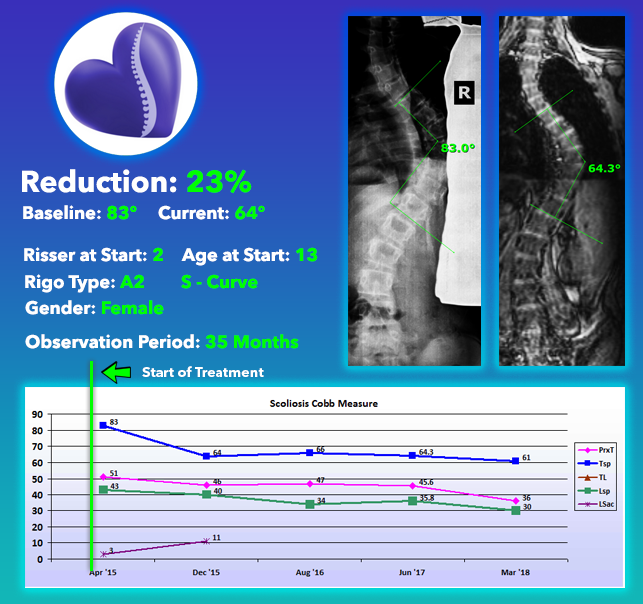 These before and after Xrays are both OUT OF BRACE. 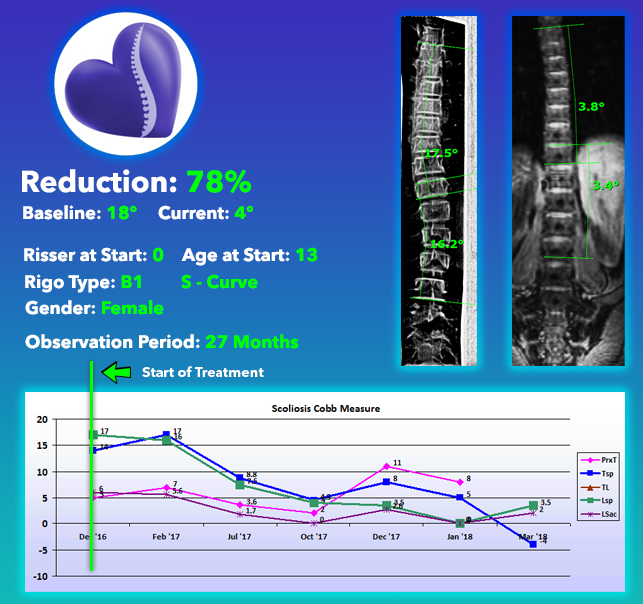 The chart at the bottom of each tile shows when the patient began care with a quarterly update of their progress. 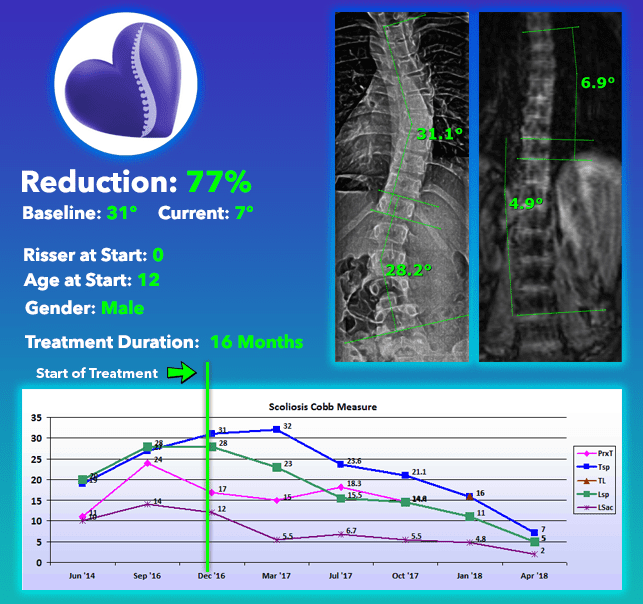 The different lines represent sections of the spine (see the legend for details). 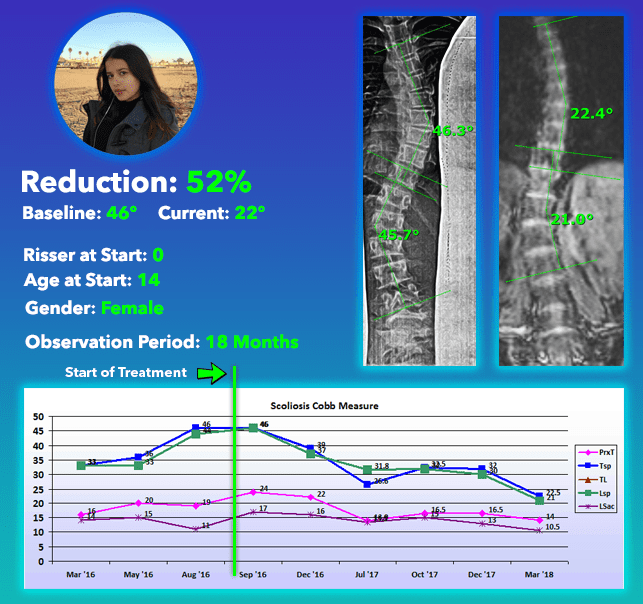 In some cases, a patient had an image or multiple taken prior to beginning non-surgical scoliosis treatment at Scoliosis Care Centers. 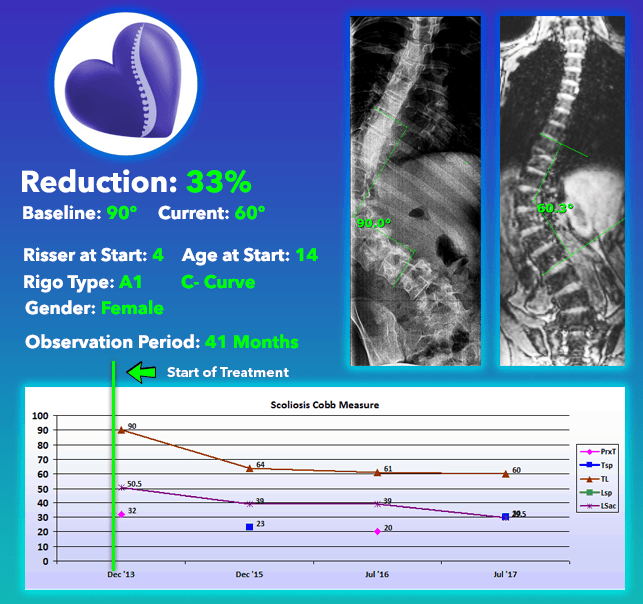 In these cases, the green line overlayed on the chart will show when they began treatment with us. 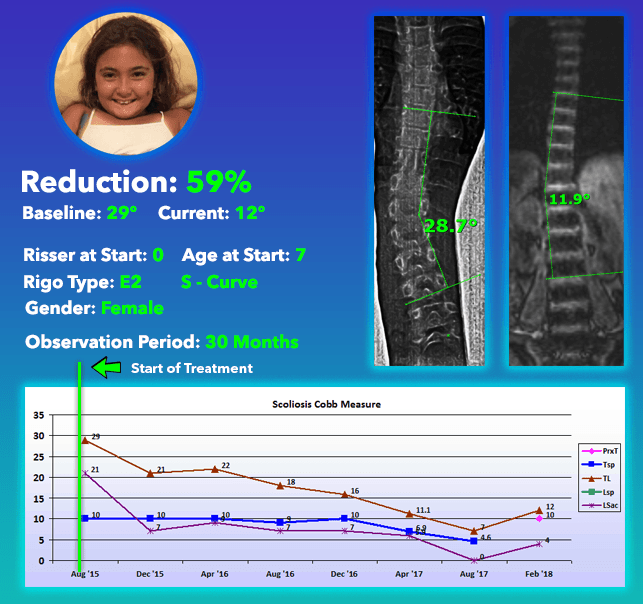 Our largest percent reduction on record for cases that began with a Cobb Angle between 10 to 24 degrees. 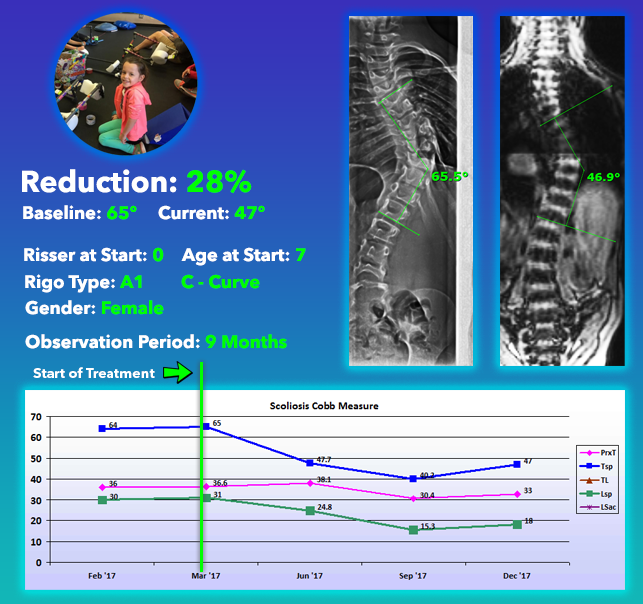 Our largest percent reduction on record for cases that began with a Cobb Angle between 25 to 39 degrees. 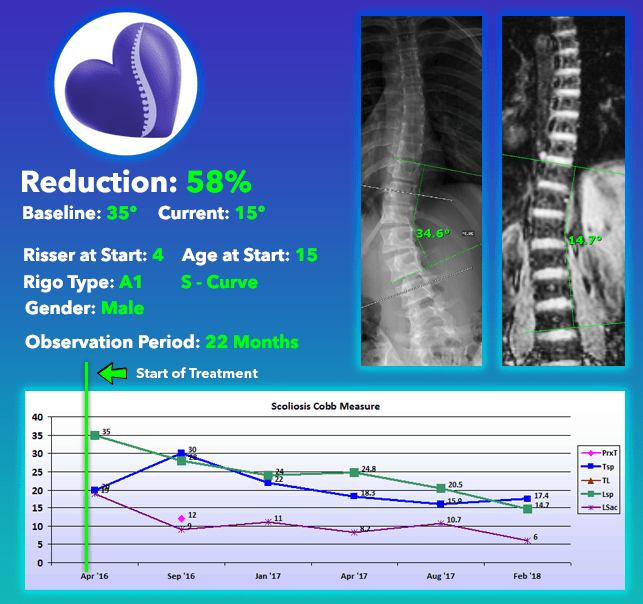 The percentage of cases in this category that were reduced from surgical range (40 degrees) to below. 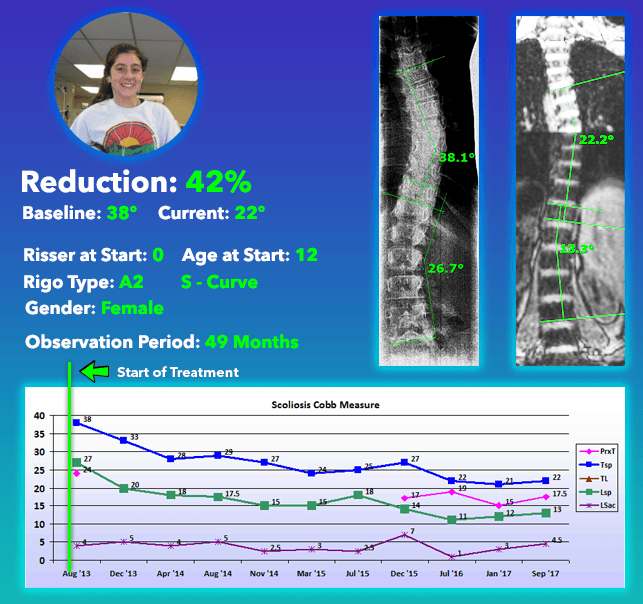 Our largest percent reduction on record for cases that began with a Cobb Angle between 40 to 50 degrees.